Early in February I suffered a back injury, which made it impossible for me to walk. For a number of weeks, I could not take more than a few, very slow, very painful steps. Three weeks ago I was finally able to walk, so I put on my running shoes and went for a short run. Just a jog, really, for a third of a mile--but it was a start. In the last three weeks I built up my distance to six miles. So this half-marathon is a litmus test for me. 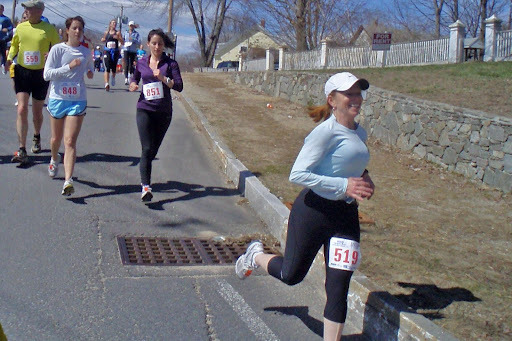 If I can run 13.1 miles and feel okay afterwards, then I will enter the Boston Marathon. (Just two weeks away!) But if I can't finish, or if I'm limping afterwards, then Boston is out of the question. So my goal today is not a particular time...but just to finish, without limping. I'm carrying a small camera as I run, and I take lots of pictures during the race. My goal is to give you a "runners-eye view" of my race experience.